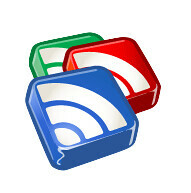 Google Reader introduced two changes last week to assist us with discovering more interesting content faster. Any improvements to Google Reader are usually well received as they enhance the functionality of the feed reader. We all need to experience 'Magic' in our lives and the Google Reader team have obliged with a setting to "Sort by magic" under the "Feed settings" menu. This re-orders items in the feed based on our personal usage, and overall activity in Reader, instead of default chronological order. The other change is the introduction of an 'Explore' section, I'm impressed with this more than the ability to use 'Magic'. Can anything really be more popular than magic? I expressed recently a desire to expand my reading preferences and this feature provides a suitable method of discovery through the "Recommended sources". This uses our Reader Trends and Web History (if you're opted into Web History) to generate a list of feeds which should be relevent. "Popular items" uses algorithms to find top-rising images, videos and pages from anywhere (not just our subscriptions), and orders them by our preferences. Google Reader continues to evolve and the latest enhancements I feel will become a primary method of how I discover content on the Internet!